Letʼsdoc Fellowship Programme aims to celebrate the fresh independent documentary vision and foster emerging talent through two mentoring sessions of 4 days each. Sessions will be mentored by some of the prominent Indian in the field of documentary. This is the 2nd edition of Letʼsdoc/DRI fellowship programme intending to and encourage talented, emerging documentary filmmakers in India, invigorating them with necessary input for international partnership and co-production. The sessions offer further development of the proposed concept/idea, providing input on skill of writing for documentary and creating a visual trailer to deal with the increasingly competitive environment of international co-production. The mentors will be finally deciding at the end of 2nd session two grantees for fellowship. 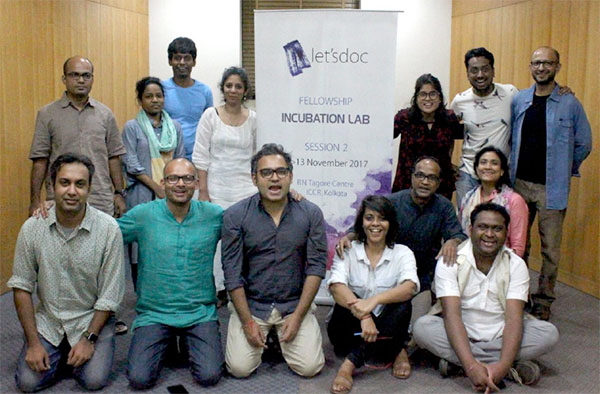 The Letʼsdoc Fellowship offers two sessions of mentoring by four mentors of four days each to twelve Indian filmmakers selected from the open application process. The sessions will take place in Kolkata. During each session, mentors will work closely with each fellow to guide him/her to help evolve the current work, offering hands-on advices, strategies and relevant input. On successful completion of the mentoring sessions and submission of the required deliverables within the stipulated time frame, the participants will be eligible for selection of two development grants for further enhancement of projects. The available grants are only for two participants as decided by the faculty jury based on the prospects and merit of the projects. The two winners of the development grant will additionally be provided with individual online mentoring for their respective projects for further assistance. Letʼsdoc is open to socially relevant, creative documentary narratives, told with unique personal viewpoint. Two out of 12 selected projects will be awarded a Development Grant of INR 1,00,000 each after the successful completion of the second mentoring session. 70% - On signing of the agreement. 30% - On submission of the final deliverables. They will also have to submit a final revised written proposal of their projects complete with the Logline, Synopsis, Treatment, Character Sketches and Directorʼs Statement within the stipulated word limit as guided by the letʼsdoc team. The grant winners will be required to include Letʼs Doc/DRI Logo along with the following text in the credits of their final films. The application for Letʼsdoc can be made only through the online application process. The online application will be available till 23:59 (IST) of August 15, 2018. Applications made over mail or not submitted before the deadline will not be accepted. Give a clear description of your film, the intended story, briefly elaborating characters, story-space, theme, issue and subject it deals with. . The treatment may include background information, story outline, visual approach, main protagonists, artistic intervention to evolve the story and ensuing moments that reflect the story flow. Provide a clear overview of whatʼs going to happen (or what you think will happen) with regard to the core conflict and resolution in the story. The selection (by an independent jury) will be based on the filmmakerʼs creative and artistic vision, besides the relevance of the subject. Unique/innovative point of view and artistic command of the filmmaker will be given additional consideration. The selection is final and no communications will be entertained with regard to the evaluation process after the final selection is announced.